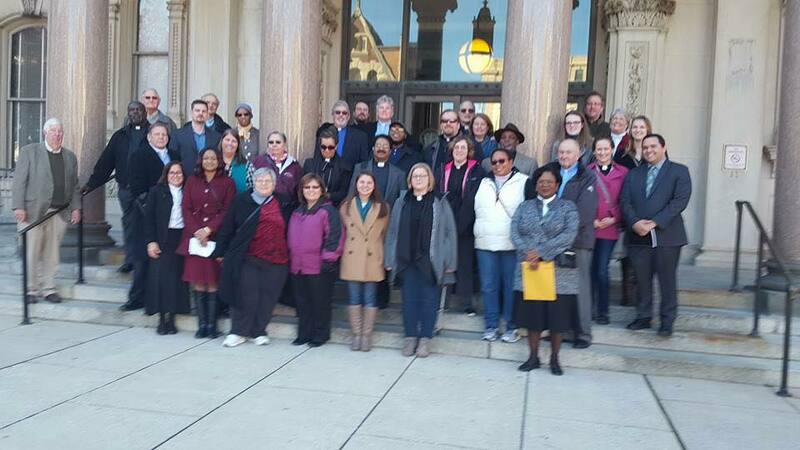 Advocating for justice, GNJ clergy publicly affirmed their solidarity with the Black Lives Matter movement through a rally and a prayer vigil on November 14. The day started at Turning Point UMC in Trenton with about 30 clergy members marching through the heart of the city to the New Jersey State House. At the state capital stairs, Wright spoke from her perspective as an African American woman and leader in the church. Rev. Gina Hendrickson, Northern Shore District Superintendent and former probation officer, felt a calling to make a statement, particularly as a Caucasian woman, to understand her own lens and biases while acknowledging others. The United Methodist presence outside the statehouse was met with a warm welcome of solidarity and thanks. “I’m with you guys,” cheered a statesman as he walked past the gathering and into the capital building. A time of remembrance and prayer was led by Raritan Valley District Superintendent, Rev. Dr. Drew Dyson. Names were read of all African Americans who perished at the hands of law enforcement in recent years. Dyson spoke from his perspective as a white man with two African American sons and specifically prayed for police officers, government and civic leaders, and families and friends who lost loved ones. The group also prayed for the church, among other societal entities, to have the courage to seek justice and confront racism. A Biblical directive was presented by Drew Theological Seminary Assistant Professor of Christian Theology, Rev. Dr. Chris Boesel who reminded the crowd that the church proclaims Black Lives Matter every day because “we follow a Palestinian Jew that had to have dark skin.” Boesel asserted Jesus’ call to stand in solidarity with the marginalized and the oppressed. “For me, this was a powerful experience because as someone who works for the conference I wrestle with how I can share my voice,” said Director of Worship Eric Drew, who closed out the gathering by leading the group in singing “We Shall Overcome.” “How do we minister to everyone, not just the people who are on our side?” he added. Many left with a sense of responsibility to figure out how to share their voices and take a stand while also grappling with the ideas of privilege and discrimination in a constructive way. “It was really a powerful and meaningful morning,” said Drew. After the rally, the group marched back to Turning Point UMC for lunch and a conversation about the next steps churches in GNJ can take to combat racism. Among some of the resources mentioned were “Between the World and Me” by Ta-Nehisi Coates, “White Like Me: Reflections on Race from a Privileged Son” by Tim Wise, and “The New Jim Crow; Mass Incarceration in the Age of Colorblindness” by Michelle Alexander.